How to get there From the west the climb starts above Meiringen in Innertkirchen (626m). 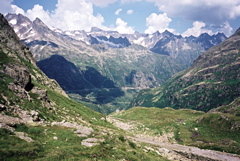 If arriving from the north or from Klausenpass, the climb starts already at Bürglen/Altdorf (488m) after a descent to 452m. If you come from the south, the Andermatt area, you start the climb when you turn off the road down the valley at Wassen (916m). (This supposes you go through the tunnel pass and up the other side of the pass as you cannot cycle with a road bike (anyway) up the east side of this pass.) It is not a very steep pass, apart from the short climb up from the tunnel, but it is a very long one!